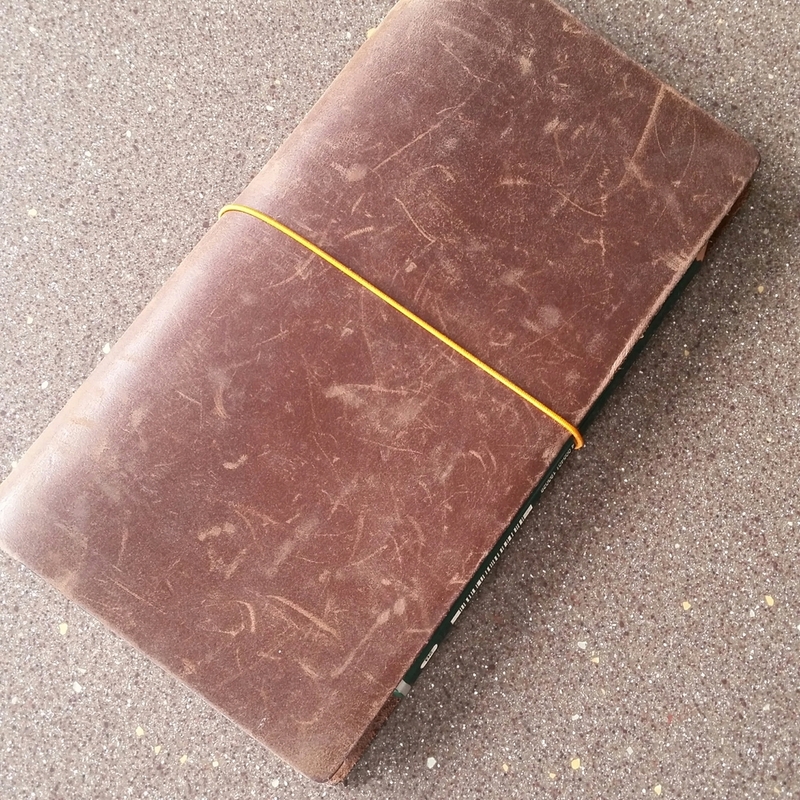 For the past month, I have been using a standard Midori as my daily carry notebook. Other than a few shopping lists, everything has gone into the Midori. 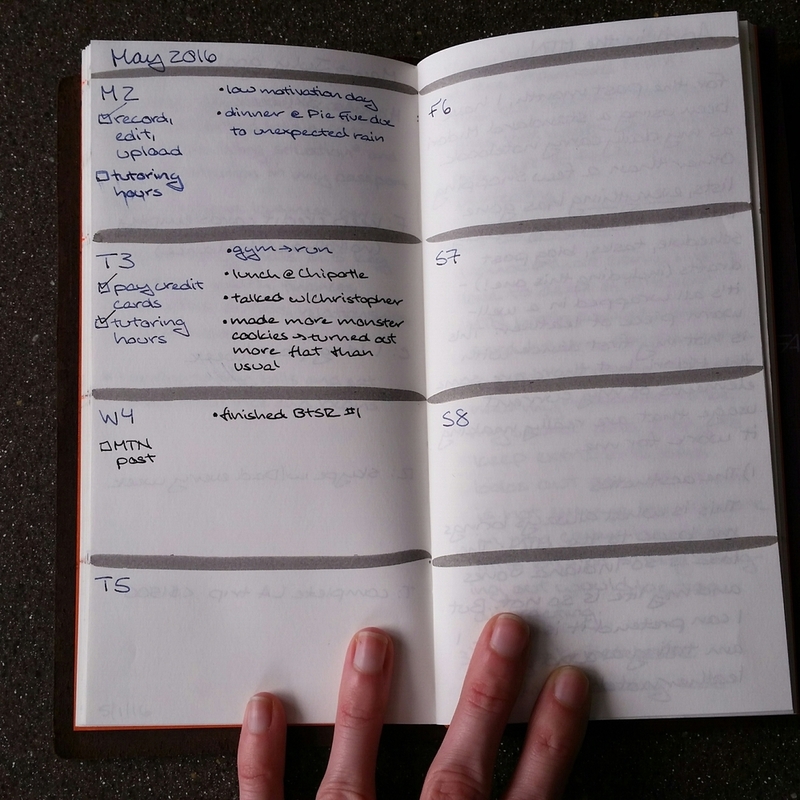 My weekly schedule, tasks, blog post drafts (including this one!) - it's all wrapped up in a well-worn piece of leather. This is not my first dance with the Midori, but there are some elements of my current usage that are really making it work for me. This is what always brings me back to the MTN. The look is so Indiana Jones and my life is so not. But I can pretend it is when I am toting around a leather notebook. I also really like the dimensions of the standard Midori. The tall, narrow format does not work for everyone but it fits my brain perfectly. I know that some users love to deck out their MTN with pockets and card holders. For me, more is just too much. I don't need my notebook to be my wallet and I try to keep extra bits and bobs out as well. There is not even a bookmark in my cover because little bits of string hanging out would be too distracting. I have exactly two notebooks in my Midori. The one in front is the one that I keep "nice" for the sake of archival posterity. The other is a madhouse and that is what keeps the front book pretty. This junk notebook is where I test new pens, color/create endless owl doodles, scribble notes during presentations, etc. As soon as something is no longer relevant I cross it out with a highlighter pencil so I can flip through and quickly see what is still active. This is not specific to the MTN, but it is really working for me and thus worth mentioning. I used to be a prolific journaler but now life gets in the way of that. But I still want to be able to look back and see what I did in a particular week. So I have started to fill my weekly planner pages with little bullet points about my day. The limited space absolves me from not giving too much detail so all I need to capture is the big picture. At this point in my life it is a method that works well and the activation energy required to do it is so low that I rarely miss days.